A deep-sea fish said to be the omen of earthquakes and tsunamis has been found in fishing nets off the coast of Peru, prompting a stir among locals. 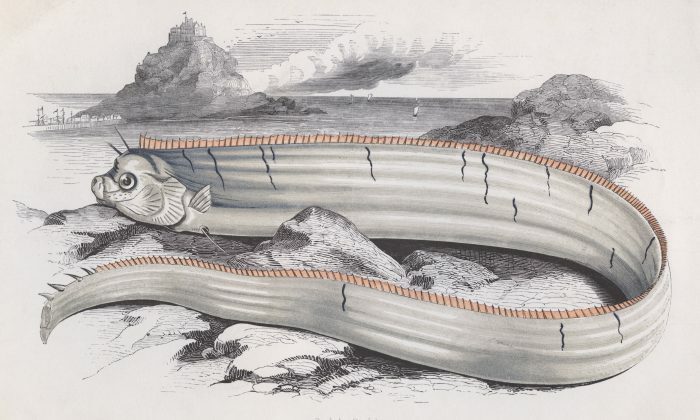 The oarfish, which can reach over 30 feet in length, is thought to be behind some of the sea serpent myths of the west. The Japanese word for this fish, ryugu no tsukai, means, “messenger from the palace of the dragon king.” According to folklore, the fish rise from the depths to the surface and beach themselves when an earthquake is coming. Several oarfish fish have been washed ashore in recent weeks in Japan, raising the profile of the legend around the world. So when reports surfaced of an oarfish caught in fishing nets off the northern coast of Peru, it caused a stir locally, especially after it was posted to a popular Twitter account that reports on natural disasters. Many local media reports in Peru say that two oarfish were found in the town of Mancora, near the border with Equador. The reports mostly appear to stem from one source: a brief news post from local media outlet Chiclayo al Minuto, which posted three photographs of an oarfish on a gangway. According to Chiclayo al Minuto, on the morning of Feb. 6, local fisherman found the oarfish in their nets. The fish, which was was about 16 feet long, initially confused them because they had never seen that species before on the northern coast of Peru. Last year, an oarfish was filmed after washing ashore on the southern coast of Peru near the town of Tacna, its characteristic long silver bodies and red fins clearly on display. #RerporteroCiudadano: "Extraña criatura marina sorprende en Playita Brava-balneario Boca del Río", informó a través de #WhatsApp de #RadioUno 994-847799. #Tacna #IMARPE► Se trataría de un "pez remo". The oarfish is the longest bony fish in the world, with the longest specimen ever recorded being 35 feet. Scientists say that there is no proof that Oarfish are able to predict natural disasters, though there are various theories as to how they might do so. The myth of the Oarfish as a harbinger of disaster gained a little ground after the 2011 Fukushima earthquake and tsunami, which killed nearly 20,000 people. There were reports of at least a dozen oarfish washing up onto Japan’s coastline in the previous year. Hiroyuki Motomura, a professor of ichthyology at Kagoshima University, told the South China Morning Post there is a more ordinary explanation for the fish appearing at Toyama bay. But, according to Rachel Grant, a lecturer in animal biology at Anglia Ruskin University in Cambridge, it is “theoretically possible” that oarfish deaths could be a signal of earthquakes to come. Professor Shigeo Aramaki, a seismologist at the University of Tokyo, dismissed the fears of social media users as “nothing” according to the South China Morning Post. A 17-foot oarfish washed up on a California beach Monday. The creature usually lives at depths of 700 to 3,000 feet and is rarely seen.